Maize (Zea mays L.), which is an important food crop in the word, displays large genetic diversity. Knowledge of the relationships among maize inbred lines is essential to the maize breeder because it directs the exploitation of germplasm in hybrid production. 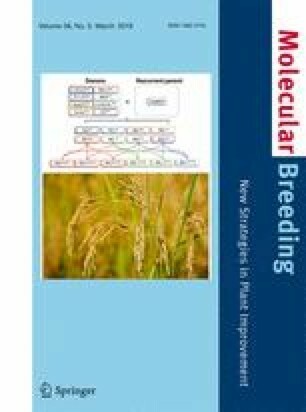 In this study, the genetic diversity, population structure, and relatedness between pairs of 157 elite maize inbred lines from the current breeding program of Sichuan province in Southwest China were assessed with 4976 polymorphic single-nucleotide polymorphisms (SNPs) developed by genotyping by sequencing (GBS). A total of 91.1% of the inbred lines were considered pure with < 5% heterogeneity, while the remaining 8.9% of the inbred lines had a heterogeneity ranging from 5.5 to 40.0%. Genetic distance between pairs of lines varied from 0.0000 to 2.0702, with 98.79% of the pairs distant. Relative kinship analysis showed that the kinship coefficients for 91.3% of the pairs of lines were above 0.500, which agrees with the pedigree. Cluster and model-based population structure analyses all divided the 157 lines into four groups, which were named Impro-local, Tem-tropic I A, Tem-tropic I B, and Impro-tropic, respectively, based roughly on genetic background of the parents used for breeding. Impro-local group consisted of lines primarily improved from local germplasm; Tem-tropic I A and Tem-tropic I B groups consisted of lines primarily developed from cross or backcross with introduced tropic germplasm, but with different combining ability that had demonstrated by the commercial hybrids; and Impro-tropic group contained lines primarily improved from continuous self-crossing of tropical hybrids and populations. Analysis of molecular variance showed 14.2% of the variation among groups, with the remaining 85.8% attributable to differences within groups. The differentiation between the groups was further validated by the pairwise FST value (0.0904–0.1520), which indicated the moderate genetic differentiation characterizing this panel. The genome-wide average linkage disequilibrium (LD) decay distance was 1.05–1.10 Mb and varied among different chromosomes. The genetic diversity and population structure revealed in this study will help breeders to better understand how to utilize the current maize germplasm in Sichuan province for hybrid breeding. The online version of this article ( https://doi.org/10.1007/s11032-019-0946-y) contains supplementary material, which is available to authorized users. We thank the team members of the Disruptive Materials and Methods Innovation in Maize Breeding in the Sichuan Science and Technology Support Project for providing the maize inbred lines. Financial support was received from the National Key Research and Development Program of China (2016YFD0101206) and the Sichuan Science and Technology Support Project (2016NZ0054).